Sony made a huge splash at this year's CEDIA trade show with the release of the VPL-VW60, a new 1080p resolution home theater projector with a sensational contrast rating of 35,000:1. The buzz on this projector has been intense, to say the least. Reader curiosity has driven the VW60 to the #1 position (as of this writing) in our Top Ten Most Popular Projectors in the 1080p resolution class. The big question is .... does the VW60 live up to all the hype? Well, yes and no. The fact is that if you buy the VW60 without seeing the competition in a side by side shootout, odds are you will be wildly enthused with its performance. My first reaction upon seeing the brief demo at CEDIA was, "Wow, now that is a good-looking image." 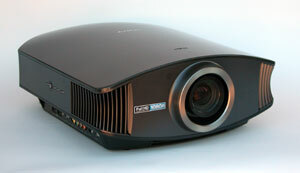 With nothing to compare it to, it will be easy for owners to imagine it must be the best new projector on the market. However, there are two things to keep in mind. First, most of the new 1080p competitors are equally impressive. Some actually outperform the VW60. They all look beautiful when viewed by themselves in a light controlled environment. You could pick any one of the new 1080p projectors at random and it would be hard to imagine you'd be disappointed in its image quality. The second thing to keep in mind is that Sony's official 35,000:1 contrast rating, even if technically accurate, is misleading-it makes the consumer imagine that the VW60's picture must be higher in actual contrast (as you experience it on the screen) than the competition. This is not the case. Several of the competing 1080p models with contrast ratings in the 12,000:1 to 16,000:1 range produce images that are visibly higher in contrast than the VW60. So forget the light meters and the technical specs. In reality, though it looks quite sparkling on its own, contrast is the VW60's most evident shortcoming when it is put up against its most formidable competitors. Since everyone is asking questions about how Model A compares to Model B, this and all other 1080p reviews to be published this fall will include a larger focus on competitive issues than our reviews of the past. Light engine: Three SXRD panels, 1920x1080 native resolution. Connection panel: Two HDMI ports, one VGA, one 3-RCA component video, one composite video, one S-video, one serial port, one 12V relay. Zoom lens and throw distance: 1.8x powered zoom/focus lens. Powered vertical lens shift. Lamp life: Anticipated 2000 hours in full power mode, 3000 hours in low power mode. does the sony vpl-vw60 discontinue?i hear there is a model name sony vpl-vw80 a.k.a vpl-vw70 will arrived soon in malaysia and currently im attracted to this sony vpl-vw60 projector..does it discontinue and what is the proce in malaysia currency?i ask the proce at one of the store that sells sony projector..he gave me rm14800 for it..but out of stock.. I purchased VPL-vw60 so far the picture is outstanding, I have 118' screen, as I watched the debate the picture was so good I felt that I was member of the audience.